↑ अ आ इ Robertson Ross, पृ॰ 24. ↑ "The Hampden Story". Scottish Football Museum. अभिगमन तिथि 3 जुलाई 2011. ↑ "Hampden Park". 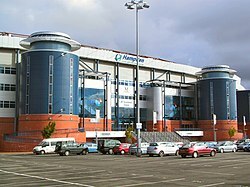 Scottish Football Association. अभिगमन तिथि 2 जुलाई 2011. ↑ Robertson Ross, पृ॰ 33. ↑ Robertson Ross, पृ॰ 72. ↑ Robertson Ross, पृ॰ 165. ↑ Robertson Ross, पृ॰ 119. ↑ MacDonald, Hugh (22 नवम्बर 2010). "Hampden roars that generate millions for Scottish economy". The Herald. अभिगमन तिथि 20 मार्च 2011. ↑ Smith, Rory (20 दिसम्बर 2009). "Top 20 sporting moments of the decade: Zinedine Zidane's Champions League final winner". Daily Telegraph. Telegraph Media Group Limited. अभिगमन तिथि 25 अक्टूबर 2011. ↑ Robertson Ross, पृ॰ 13.